Doncaster Phoenix secured their first win of the new Midlands Premier Division season with a comfortable 24-7 victory at home to Nuneaton. 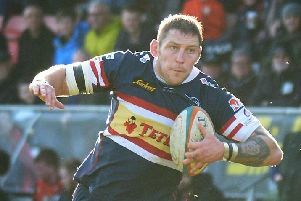 Seth Adams scored the opening try after five minutes and went on to kick another nine points. Nuneaton bagged a penalty try on the half hour but scores from flanker Jay Robinson and prop Joe Lowcock either side of the interval ensured that the result was in little doubt. Conditions were very wet but the Castle Park pitch was in great condition for Phoenix’s fast running backs and their forwards held their own against a strong pack. Phoenix’s defence was excellent all game and reduced the visitors to just one score when the home team was down to 14 men due to a yellow card infringement. The hosts were unlucky not to pick up a fourth try bonus point and had two attempts held up over the line. A couple of try scoring passes also failed to stick in the wet conditions. Phoenix travel to Sandbach on Saturday. Wheatley Hills ground out their first win in Yorkshire Division Two by edging to a 19-16 triumph at Barnsley. Owen Gilvray, Mark Cahill and K Ramrattan were on the trysheet for Wheatley. Thornensians made it two wins out of two in Yorkshire Division Three by easing to a 38-0 victory at home to Baildon. Ryan Pilley (2), Zak Holgate, Luke Marsden and Martin Moffat scored the tries for Thorne.